Hope you are are enjoying the cool weather. As the seasons change, I like to alter my skincare regimen accordingly. As you may know I suffer on and off from acne, pimples breakouts, zits whiteheads, blackheads, whatever you want to call it :-(.. I am forever looking for a cure for acne, and its no use treating the symptoms you actually have to look at the causes. One of the causes of acne is stress, whether it is from school, exams, work, deadlines, family obligations and general day to day life stress can cause acne. finding sometime to unwind and relax on a daily basis. 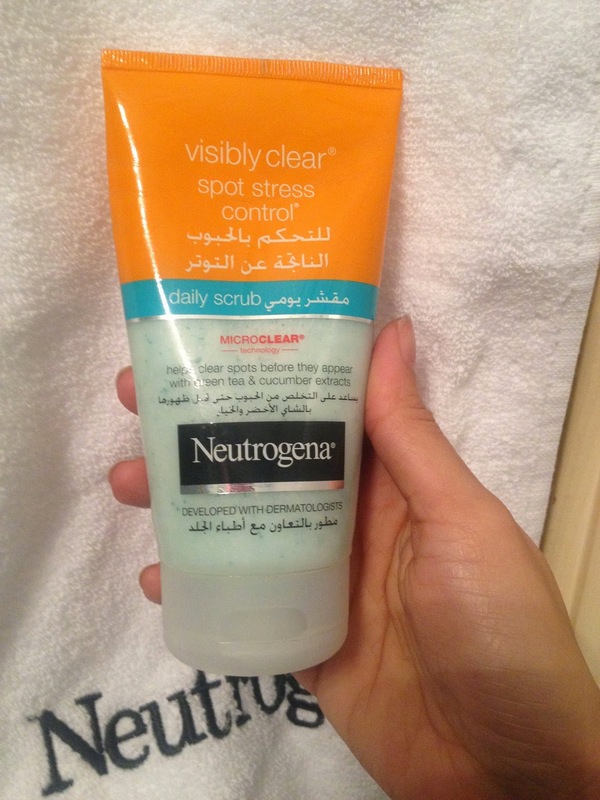 In order to help us fight stress related acne, Neutrogena has come with a face wash called Visibly Clear Spot Stress Control Daily Scrub. I have been using this for a few months now and I can say it is the strength, light enough to be used daily and strong enough to make a noticeable difference. Suitable for acne prone oily/combination, sensitive skin. I have combination skin which is crazy sensitive and this didn’t irritate it so I am super pleased! The NEUTROGENA VISIBLY CLEAR® Spot Stress Control Daily Scrub contains microbeads to gently exfoliate skin whilst the powerful Microclear®technology unclogs pores allowing the formula to penetrate deep down and help clear spots. With green tea and cucumber it soothes the skin and it is gentle enough to use every day without drying the skin. The green tea and cucumber combo smells great and has revitalising and relaxing effect. The skin tingles a bit so you can actually feel it working but it does not irritate. Daily usage will rid of black heads and white heads. There aren’t really any cons. i just want to say it doesn’t completely rid you of your acne, but if the cause of your acne isn’t skincare/topical causes it is not the product’s fault. For example, if you have adult/teenage acne caused by hormonal changes/imbalances then it will not cure it- you will need to see a dermatologist for that. Apply it on your face before you brush teeth, and leave it on your face to do its magic while you brush your teeth you will feel your skin tingling, rinse for super soft smooth skin. 4.5 /5 It is one of the best face cleanser product I have tried in a while and for a very reasonable price. Subscribe for new blog post delivered to your inbox for free at the top of the page. Stay connected follow on Instagram, Facebook, and Twitter.